Join us for the opening of a gallery exhibition showcasing a range of art work exploring impacts, solutions, and questions about climate change – eight artists explore various dimensions of the future of a hotter, wetter Philadelphia. Two artists made “river prints” dipping handmade paper into the pollution on the surface of the Delaware River; one paints exquisite watercolor landscapes, the contours following the data graphs of key climate indicators such as CO2 concentrations; another artist creates paperworks inspired by the tunnels built by bark beetles. Though unquestionably one of the most pressing issues of our time, climate change is classically difficult for us to wrap our minds around. Art about climate change has a unique potential to make these problems personal and relevant, with artists able to serve in the role of commentator, collaborator, storyteller, catalyst, and more. Drawing lines between global phenomena and what happens in our own lives and communities means the difference between despair and engagement. More on the show and the artists here. Daniel Crawford created a string quartet composition from climate change data that uses music to highlight the places where climate is changing most rapidly. Lorrie Fredette presents a ceramic installation responding to Lyme disease, which is projected to spread as climate change increases the range of suitable tick habitat. Jim Frazer’s paper works are derived from bark beetle chewing patterns, an issue for forests which is expected to increase with a warming climate. Eve Mosher’s High Water Line (in Philadelphia and other cities) engaged communities with local issues of sea level rise and flooding. 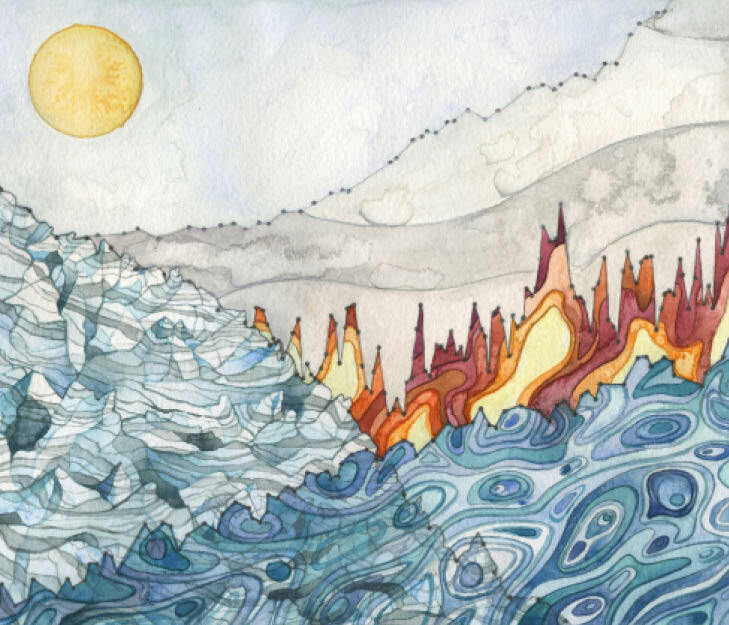 Jill Pelto uses climate change data as a point of departure for her watercolor works to communicate scientific research visually. Kaitlin Pomerantz & John Heron created handmade paper from found fibers, printed onto with the scum of a polluted estuary along the Delaware River. Michelle Wilson’s Carbon Corpus project explores the implications of individual food choices for global climate change. This exhibition is supported in part by the Climate & Urban Systems Partnership of the Franklin Institute.